If what you have to say isn’t more beautiful than silence… Shut up. Confuses for Presentations and tweets methinks. Those who think they are good find the need to state it. Those who know don’t. Never underestimate # of people capable of spending 8hr transatlantic reordering bullets\slides & believe they spent the flight working! 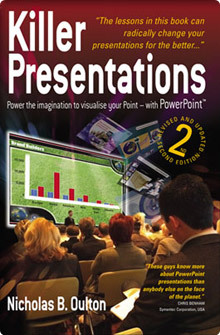 Presentations are what happened to the audience, not what was intended by the presenter. Presentations without structure are not presentations they are ramblings; occasionally interesting often inane always inadvisable! Simplifying Complexity is genius (& hard); Complicating Simplicity is foolish (& easy); which presenter are you, Wise man or Fool? Knowing your philosophy is right isn’t important. Knowing it’s wrong is more productive. If the best thing about your presentation is the design… You’re screwed! What people feel influences what they do.. Not what they say.. Audiences don’t often care about what you want. It’s difficult to over prepare for a presentation. But not impossible. Anybody who has attended either one of my seminars or a training course will no doubt be used to me talking about Plato and Socrates.. Socrates believed that the only way of improving our intellect was verbal rational debate; his love of philosophy (the love of wisdom) was driven from a verbal discourse base. In the UK our political system is based on the same idea, stand up and debate your case. Prime Minister Question time for those who watch TV late at night! Written arguments, white papers, even blogs are not as persuasive nor as revealing as the cut and thrust of a debate. Having to make your case, justify your arguments and think on your feet is central to our political system; our education system and, I would argue, human relationships. I am in agreement with Socrates. Well I am in agreement with what we think he believed, clearly we don’t really know ‘cos he’s dead! In fact the only reason we know anything about him is that one of his pupils Plato disagreed with him and felt that art of writing your arguments down helps you orgainse them and think about articulating them well. If he didn’t he wouldn’t have written about what Socrates said and we wouldn’t know about it 2362 years later. So Plato’s quote above about practice applies to debating skills and the art of writing. I struggle to write (probably dear reader.. evidently! lol) and so blogging has always been a bit of a challenge for me. I am mildly dyslexic and don’t (unlike my kids) touch type. And what is funny is that the more we practice this.. the better we get at it. Most people put time and effort into avoiding practising (we call this practice avoidance.. clients often call it playing with PowerPoint!) but at some point the writing has to end and the practice has to begin.